The Kugelbunker (Ball or Spherical Bunker) was a late war expedient and may have been derived from the Finnish ‘Ball’ bunker which was based on the idea of an American naval officer. 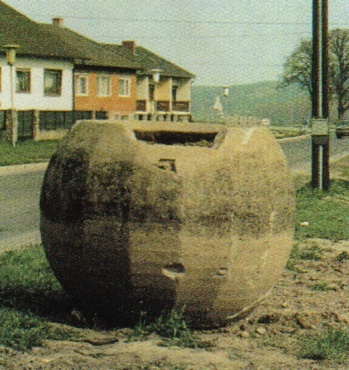 The Kugelbunker had a diameter of 2.13m and could sleep four men, but a smaller version was also more widely used. 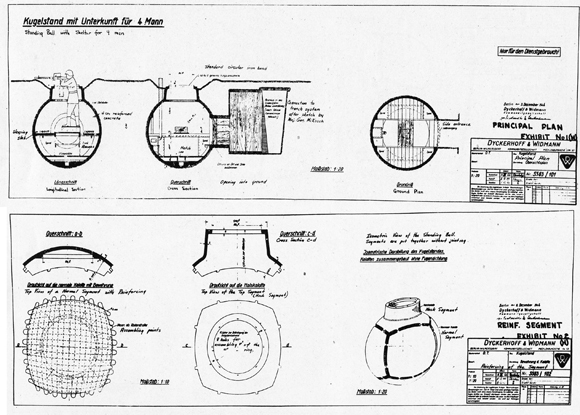 One of the final developments in German bunker design was the creation of the Kugelbunker or spherical bunker. Similar in appearance to the Finnish ball bunker, its construction method was different. Few details are available about it beside a post-war report made by the Joint Intelligence Objectives Agency in 1945, which identified one variant. According to this document, in late 1944 Dr Hubert Rusch of the engineering firm Dyckerhoff and Widmann created most of the designs for these bunkers. The army quickly adopted them and ordered several thousand. Production was to be done at about twenty concrete plants in Germany, but the only production centre identified was a Dornbirn, near Lake Constance, where two to three dozen men in each of five concrete plants built them. The largest factory produced six a day. Since production only began in April 1945, all twenty to thirty Kugelbunkers made at Dornbirn went into positions close to the nearby Swiss border. These bunkers consisted of six segments cast in concrete, the top one of which was different since it included a neckpiece that served as an entrance as well as a fighting position. The other five sections were similar, but side entrances could be chiselled into one or two of them after all the segments were cemented together. When the bunker was assembled, its diameter was about 2.1m and its neck was about 37cm high. The interior included a place for four sleeping slabs, although it would not be practical for all four men to stand up at the same time. The man on duty stood on a platform allowing him to occupy the open neck. The wall thickness was 4cm, but the interior was designed for metal reinforcements although none was actually used. The entire bunker weighed less than 2 tons, which facilitated its transportation because several specimens could be placed on a trailer, hauled to the site, and rolled into their excavated position. Since Dornbirn was near the Swiss border, all the bunkers produced there were installed nearby, which made them part of the fictitious National Redoubt. Little data exists on other types of Kugelbunkers, but it appears that some plants produced a larger number of smaller ones with a diameter of only 1.7m, but a thickness of 10cmm, which had barely enough room for one or two men. Some of these have been found on the Lower Danube front and in Slovakia as part of the defences of the Southeast Front. The bunker on display in the Vienna museum has the entrance at the bottom, but it seems more likely that it would have it on the side or the top from where the occupant could fight as seen in some photos taken in situ. These were the last bunkers of the Third Reich. This entry was posted in Fortification, Germany by MSW. Bookmark the permalink.